To reduce chronic school absences, Cleveland focuses on positive family support. A few years ago, Cleveland Public Schools found that more than half of their students were chronically absent, missing at least 10 percent of school. While they've made steady progress to address the problem, like may school districts around the country, they still have a ways to go. Missing a day of school here, two days there may not seem like a big deal, but, before long, those days add up, and students aren’t learning, and they’re struggling to keep up academically. Seven million children in the U.S. are considered chronically absent. That means missing 10 percent of the school year. States are beginning to take the problem seriously. For the last few years, schools in Cleveland, Ohio, have made a big effort to encourage students to get to class every day. Special correspondent Kavitha Cardoza with our partner Education Week found steady progress there, but also a long way to go, for our weekly segment Making the Grade. It’s 7:00 in Cleveland, Ohio, and it’s dark, cold and snowing, the kind of day when it’s difficult to get out the door. But Amanda Watkins prides herself on her daughter’s perfect school attendance. I can’t miss a day. It’s my perfect attendance, not even hers. In Cleveland public schools though, that kind of attendance record is not typical. A couple of years ago, school system leaders found more than half of their 40,000 students were chronically absent. The problem starts as early as kindergarten. Principal Brittany Anderson at Patrick Henry School greets every child as they come in and their parents. A lot of parents expressed that they didn’t feel welcomed in the school in prior years. So, once a week, she sets out coffee and pastries. At first, it was just a way to get them in. But then the coffee clubs turned into a way for the parents to talk to teachers. That way, we can have these conversations with our parents without it feeling formal. Diamond Gadomski has three kids in the school. She appreciates the warm welcome. When you come in, you see smiling and friendly faces with stuff to give to you, hot treats or whatever, it makes you feel good. Anderson says building good relationships with parents makes it more likely they will bring their children to school, even on a day like today. If our scholars are not here, then they are not learning. Students who miss a lot of school are more likely to drop out. Robert Balfanz, a researcher with Johns Hopkins University, found a direct link between attendance and academics in Florida. Essentially, we found that each additional day of missed schooling, students had one fewer point on the state test. So, miss 10 days, lose 10 points. Miss 15 days, lose 15 points. But because schools used to track attendance differently, Balfanz says, until recently, states didn’t even realize there was a problem. Traditionally, schools have measured average daily attendance, which is how many kids on average are in the building on a given day. And except in the most extreme cases, that’s almost always in the 90s. And we’re hardwired to think 90, A, good. But it turns out that you can have an average daily attendance in the low 90s and still have a quarter of your kids missing a month or more of school. Chronic absenteeism affects all students, says Hedy Chang with the nonprofit Attendance Works. A teacher now is faced with the choice of repeating lessons or keeping going on for the kids who have been there. And that churn slows down the ability of an entire classroom to move forward. A new federal education law signed into effect by former President Barack Obama goes into effect this year. Now all states will be required to track chronic absenteeism. It’s typically considered missing 18 school days or more. But Cleveland leaders found even missing just one day a month made a difference. So they started a public relations blitz. 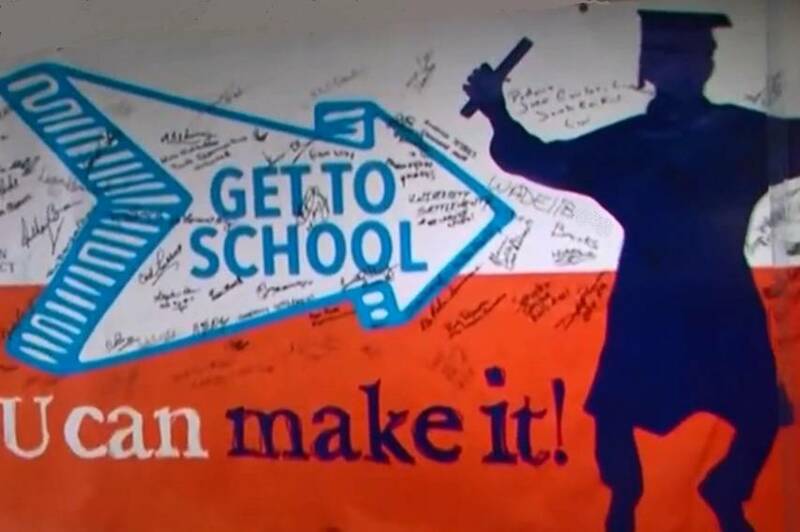 The slogan, “Get to School, You Can Make It” was on billboards, posters, magnets, T-shirts, even grocery store bags. Everyone helped staff a daily phone bank, board members, principals, bus drivers. They made 16,000 calls the first year. The reason for the call is, Jaylen has missed four more days of school. Keisha Bullard is a kindergarten teacher. Is there anything that we can do to assist you? In the past hour, for instance, I think that I have dialed maybe 20 numbers, 30 numbers. Low-income families, in particular, face many challenges. With the weather being like it is, it’s asthma. Most of the time, it is transportation or illness issues. Lorri Hobson, who’s in charge of attendance for the district, found lots of kids miss school simply because they don’t have clean clothes. We provide uniforms to any family who needs a uniform, and what we discovered was, attendance improves for as much as six weeks after receiving a uniform. Cleveland schools partner with several organizations to help provide families with everything from a bus pass to emergency shelter to legal help. This makes sense, Chang says, because a school district can’t solve deeper social problems on its own. When you have high levels of chronic absence, often, it means that there are these bigger challenges, and you really need to have a community approach to address it. In Cleveland, it’s an all-out effort. A community college offers scholarships as incentive. Local businesses check attendance before hiring, and the Cleveland Browns players visit schools regularly. Whenever you are late, that means you don’t have respect for the other person’s time. In the NFL, you get fined. So, I think our fine if you miss a meeting might be like $10,000. Some districts do use punishments, such as fines, jail time and taking away driver’s licenses, but Cleveland schools have found focusing on positive messages far more effective. We show up every day, and so should Cleveland students, even when it’s cold outside. Get to school, Cleveland. We know you can make it. In the last two years, Cleveland’s chronic absenteeism rate has dropped from 50 to 30 percent. At Cleveland High School for Digital Arts, principal Jasmine Maze and a local radio celebrity are hosting a surprise celebration, because students have made their attendance goal. You never know when D.J. Incognito’s going to show up and just come here and throw up a party. Ninth grade is another year when students are most likely to miss school. But, today, everyone is glad they’re here. That’s the icing on the cake, Z-109.7 being here. Well, it’s cool because it brings everyone together. Like, it’s something unexpected. I think it motivates kids to come to school, because they don’t want to miss school stuff like this. Eric Gordon is the CEO of Cleveland Schools. He says they have moved from rewarding perfect attendance to recognizing students who come to school regularly. Someone watching might say, really, a party just for coming to school? Like, isn’t that what kids are supposed to do? Well, yes, it is what kids are supposed to do. I would challenge people to look at their own workplace environments, though, where companies give bonuses for all kinds of things, including high attendance, where they have parties for their staff for performing well. Incentive is part of how you create behaviors. In Cleveland, thousands more children now attend classes regularly, but a third of the district is still missing 18 days or more of school, and Gordon says it will continue to take a lot of effort. For “PBS NewsHour” and Education Week, I’m Kavitha Cardoza in Cleveland, Ohio. One update to our education story from a couple of weeks ago on the teachers strike in West Virginia.